Does the largest OLED set yet herald a new dawn for the television market? Update: LG has confirmed that the LG 55EM960V will hit UK shops in the second half of 2012, priced at 9,000 Euros (around £7,000). OLED has been threatening to take over the television world for the last three years, but until now we've seen very little in the shape of living-room sized devices entering the arena. What we've seen at CES is that threat finally becoming a reality. Before the show, the LG 55-inch OLED TV (55EM9600), which is the world's largest was picked out as a must-see and we're happy to report that seeing truly is believing. This TV was front and centre as soon as we walked onto the LG stand at CES. Immediately we were hit with the beauty of the 3D OLED pictures, but it's not until we walked around to the side of the heavily-guarded set (it wasn't so much a hands-on, but an eyes on from a few feet away) that we realised the true miracle of the device. It's ridiculously thin. At about 4mm thick, which is about the same width as a pencil and is about the same thickness as two iPhones. Naturally there's no room for connectivity and power ports so they live at the base of the device. The bezel on the device is virtually non-existent meaning the LED-backlit OLED panel almost runs edge to edge. 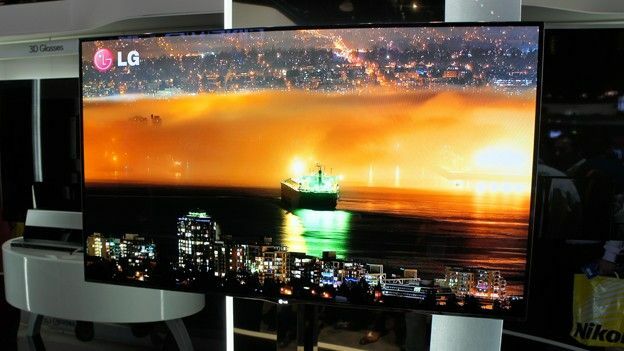 It is truly a piece of technological art and weighs in at just 7.5kg, which is about half the bulk of an LED TV. Not content with showcasing the world's largest OLED TV, with stunning 2D and 3D pictures, LG has also incorporated the Smart TV platform, which means all of your favourite connected TV apps, like the iPlayer, LOVEFiLM and so forth will be present on this device thanks to the built in Wi-Fi. 3D is brought by LG's 3D Cinema technology, which is passive 3D to me and you. It's also compatible with LG's Magic Remote which will allow you a Wii-like experience when navigating around the UI, while also offering voice recognition tech. OLED technology has been wowing us for the last few years, ever since we first laid eyes on the first 11-inch Sony display back at CES 2009, but we've never experienced its beauty on such a large, living room sized scale. We were absolutely stunned by the picture quality in both 2D and 3D, it really is a take-your-breath-away experience that's pretty unrivaled. Behind the hyperbole, LG explains that the device is able to perform at such an astonishingly high level thanks to the 1,000,000,000:1 contrast ratio which is 50-times larger than the average LCD or LED television. The OLED tech is powered by LG's own Triple XD engine which comprises of Dynamic Color Enhancer (providing superior color reproduction), the Contrast Optimizer and the Resolution Upscaler. From edge-to-edge, in both 2D and 3D we were greeted with incredible clarify and perhaps the most vibrant colours we've ever seen on a television set. We were memerized by the quality on show here. The sheer brightness of the pictures absolutely knocked our socks off, while the deep blacks were very, very deep. Viewing angles seemed quite wide in both 2D and 3D. Naturally, on a 4mm device, there's no room for protruding speakers at the size of the device, so the speakers are housed at the rear of the device. Unfortunately, we were unable to experience the audio performance on the showroom floor. LED and LCD TVs have served us admirably for the last few years, but OLED looks finally ready to assume the crown and deliver the best possible picture quality to our living rooms. LG is leading the way with the first 55-inch device, while Samsung is also getting in on the act. The picture quality on show with LG's model is completely beyond reproach, while the design is a miracle of modern tech innovation. We'd advise you to start saving now. LG 55EM9600 55-inch 3D OLED TV price and availability: LG is intent on getting this device into the home soon and it's likely that we'll see this in the UK in the second half of the UK. You'd expect this to be the most expensive TV on the market. LG is saying it'll be affordable, but it's very much a case of waiting and hoping on that front. The presence of Passive 3D might lighten the cost on this occasion.